Homemade rust removers range from the innocuous, which contain common household ingredients, to the take-extreme-caution-while-using, which potentially dangerous chemicals. 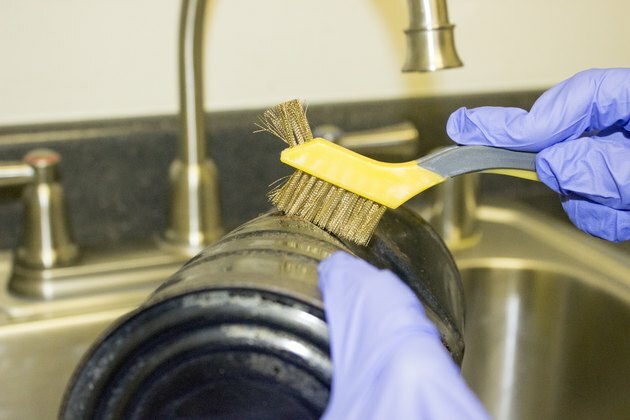 It's advisable to first try the homemade rust remover recipes that pose no risk before going on to rust remover remedies that require precautionary measures before use. Try using carbonated water to dissolve rust. 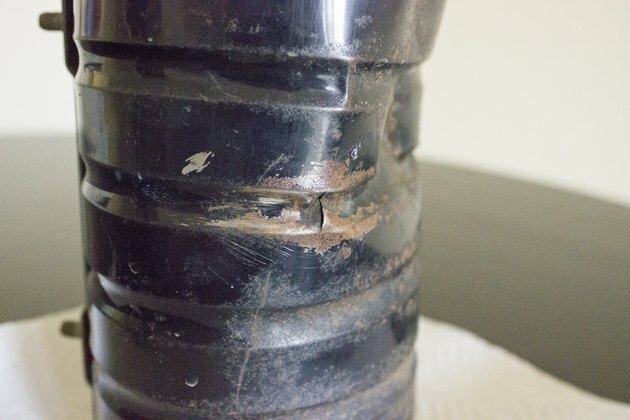 Carbonated drinks contain carbonic acid and can be useful in reducing rust deposits. Sprinkle table salt over rusty areas and squeeze lemon or lime juice on top. Leave the mixture for two to three hours and then scrub with the rind of the fruit. Mix 1 tsp. cream of tartar, 1 cup of Borax or baking soda and enough hydrogen peroxide to make a paste. 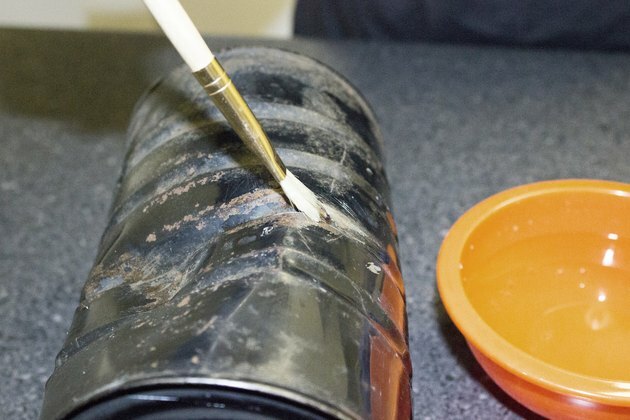 Apply this paste to the rusted area and allow it to sit for 30 minutes. Wipe clean with a damp cloth. Repeat if necessary. 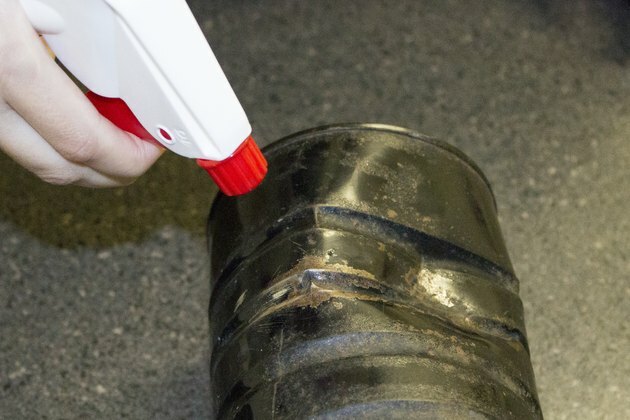 Soak or spray the rusty area with white vinegar and let the acetic acid dissolve the rust. Scrub the vinegar into the area with a scouring pad or brush, apply more vinegar and let it sit for 30 minutes. Wipe clean and repeat as necessary. 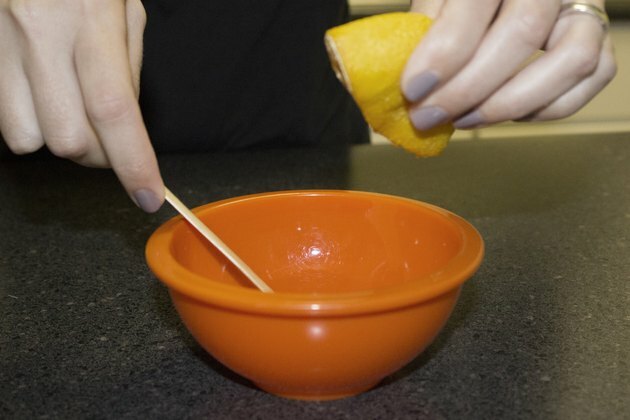 Mix Borax and lemon juice together, creating a thick paste. Apply to rusted area and leave for 20 to 30 minutes. 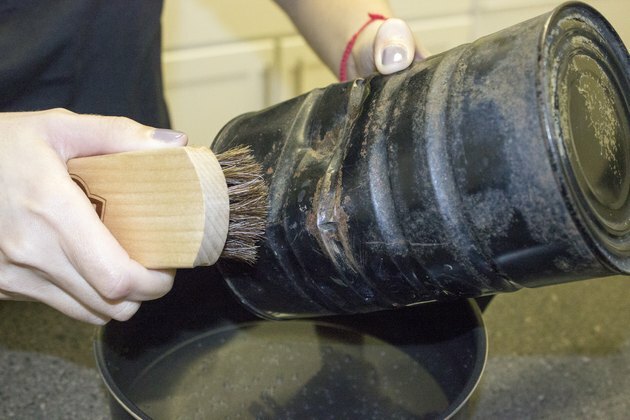 Scrub the rusted area with a scouring pad or steel wool. Repeat as necessary. Combine 1/2 cup of trisodium phosphate with 1/2 gallon of warm water. Soak the rusted area for 15 to 20 minutes. Scrub the area with a bristle brush and repeat as necessary. Wearing goggles, gloves and a mask, mix one part muriatic acid (hydrochloric acid) with four parts water. Apply the solution to the rusted area. Brush and rinse thoroughly. Take care using this corrosive acid. Don protective gear before mixing a solution comprising 2.5 percent phosphoric acid, 2.5 percent muriatic acid and 1 percent 2-Butoxyethanol. The phosphoric acid turns iron oxide into a blackish, water-soluble compound. The muriatic acid dissolves iron oxide. Butoxyethanol is a component of retail rust removers. Spray or pour the solution on the rusted area in a well-ventilated area that is inaccessible to children and pets. Scrub the area to free it of flakes. Rinse with turpentine to remove any oil and wipe clean. Repeat if necessary. Cap or cover the solution container and store in a secure place. 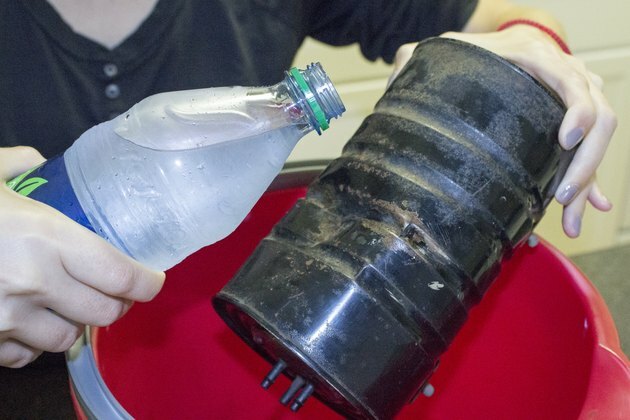 Rinse the container with water once you've used all of the solution and discard it in the trash or recycle it. Use water to wash away solution residue. 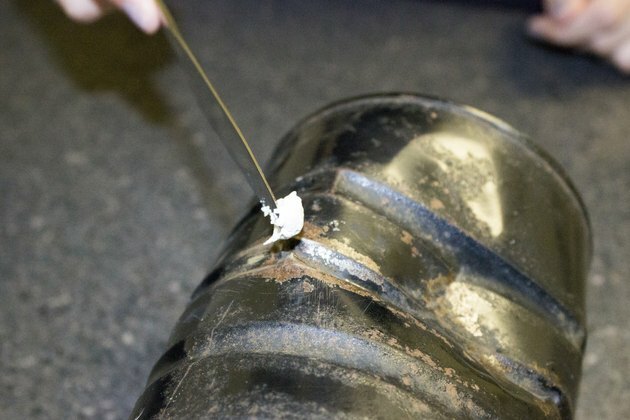 Try electrolysis as a rust-removal method for stubborn and heavily rusted parts. Wearing protective gear in an outdoor area, mix 1/2 to 1/3 cup of laundry soda with five gallons of water in a plastic bucket. (To make laundry soda, spread baking soda on a cookie sheet and bake it for an hour at around 305 degrees.) 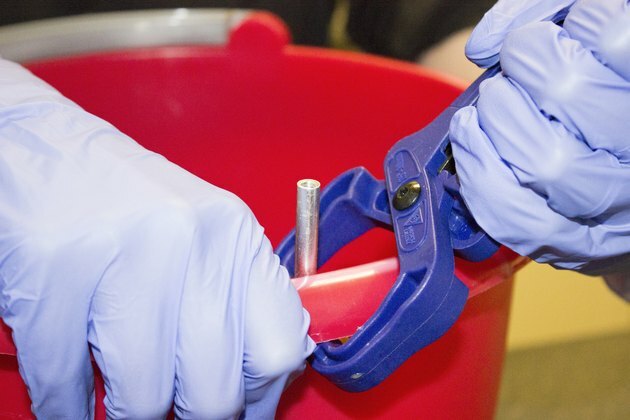 Place electrodes in the bucket so that 4 inches protrude above the bucket and clamp them with any type of clamp except copper. Tie electrodes and wire or cables together. Suspend the rusted part so that it hangs in the middle of the bucket but does not touch the bottom and does not touch the electrodes. Use clamps and a length of chain to attach the rusted part to a length of rebar and then place the rebar across the top of the bucket to suspend the rusted object in the solution. Attach a battery charger, the negative lead to the rusted part and the positive or red lead to the electrode configuration. Turn on the battery charger and watch the rust molecules gravitate to the electrodes. Turn off the charger. Dispose of the iron solution outdoors and wipe down the rusted part and your electrodes with a rag.